Join us to push for Good Food & Good Farming — Ta’Qali Farmers’ Market on the 27th of October! This October Friends of the Earth Malta with our partners all over Europe, invite people to raise their voices to ensure that policies support farmers, the environment and climate-friendly agriculture that is tied into local economies over global food chains. Every single day thousands of local farmers are working hard to produce wonderful, healthy, refreshing food for our plates. We need to save this. All across Europe citizens are standing up for Good Food & Good Farming! Join us to contribute to a powerful movement. Be part of the European Days of Action for Good Food & Good Farming in Malta. 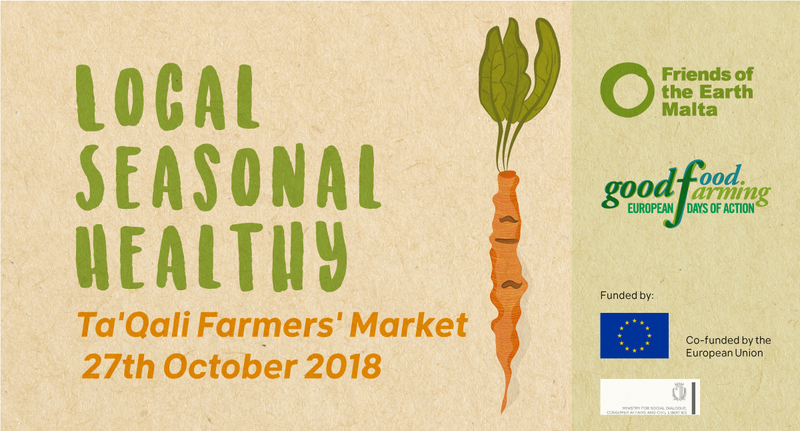 We will be at the Ta’Qali Farmers’ Market on Saturday, 27th October, from 8am to 1pm, showing support for good farmers and asking you, what sort of food and agricultural system do you think needs supporting. We will have healthy snacks made from local and seasonal produce so that we can picnic, share ideas and discuss how we want our food produced. More and more citizens are concerned about where food comes from and how it is produced. 2018 is a vital moment for the future of our food in Europe: every year €60 billion of taxpayers’ money is distributed to farmers via the EU’s Common Agricultural Policy (CAP). Right now, the biggest farmers get the most money. But a reform of the policy is underway, and many other laws are being discussed at the same time, affecting the way we farm and what we eat. Now is the time to stand up! If you cannot join us at the Ta’ Qali Farmers’ Market on the 27th of October from 8am to 1pm, you can take action in other ways. Fill in the form below to let us know what changes do you want to see int he current agricultural model. How do you want food production to change both locally, on EU and global level. Your contributions will go for FoE Malta to submit it’s representation on the future of the Common Agricultural Policy, showing that citizens are demanding good food and good farming. 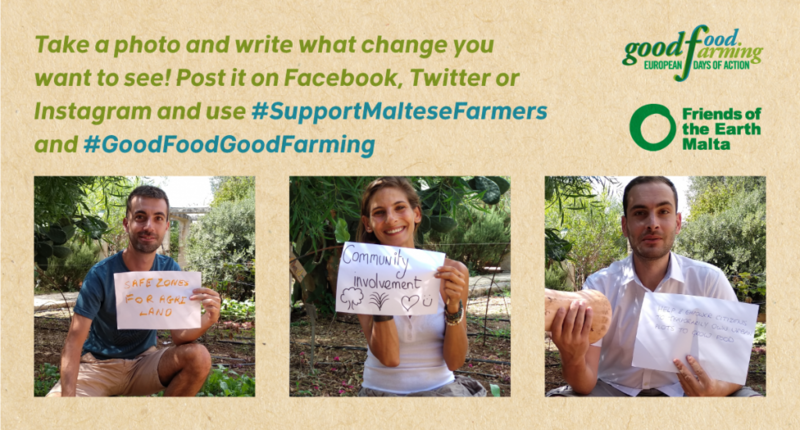 You can also take a photo of yourself, a friend, a farmer, rural land, a meal you are eating, vegetables you just bought, and write what change you want to see using the #SupportMalteseFarmers and #GoodFoodGoodFarming. This project has been funded with support from the European Commission. This action reflects the views only of the author, and the Commission cannot be held responsible for any use which may be made of the information contained therein.